The 56’ Marquises built by Fountaine Pajot is an excellent vessel designed for worldwide cruising and sailing in elegant style for two to six people. “Jon Boat” is a rare find in today’s market place. Offering the distinctive 3 stateroom 3 head layout and being setup for single handed sailing thanks to her self-furling main and self-tracking Jib which is preferred on this wonderful sailing catamaran.Attention to detail has always been the focus as this custom boat was created for a very particular owner who sailed her worldwide. Her current owner has done a complete refit that boasts state of the art navigation, communication and safety systems which will enable her to circumnavigate the world again with her new owner. She has all the comforts of home, air-conditioning, water maker, ice machine, a central music system with indoor and outside speakers, Washer/dryer, dive compressor, and the list goes on. She is new to the market place and a must to see if you are pursuing your dream of worldwide cruising or looking to start your own charter business. West Florida Yachts would love to guide you through a personal showing of this 56' Fountaine Pajot Marquises 56 1999. 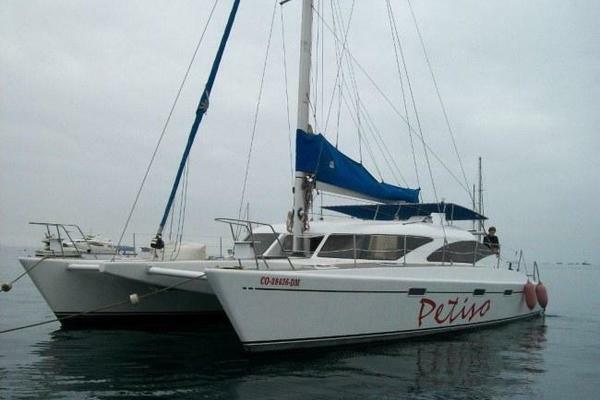 This yacht for sale is located in Key West United States and priced at $498,850. For a showing please contact us by filling out the form on this page and we will get back to you shortly! The interior has been designed for exclusive luxury (owner configuration) thus accommodating the owner and 4 guests comfortably. The feeling of bright, open spaciousness is conveyed immediately upon entering the cabin. The opened plan galley / bar has 2 plush leather seats and traditional cherry wooden interior is found throughout. A large dining table is to port and a comfortable settee is to starboard. The galley is forward to starboard and navigation station is forward to port. The 2 guest cabins are to port and pleasingly spacious. Both Cabins have ample head room, queened sized beds, individually controlled air-conditioning, en suite bathroom facilities with an independent shower, hot and cold pressure water. 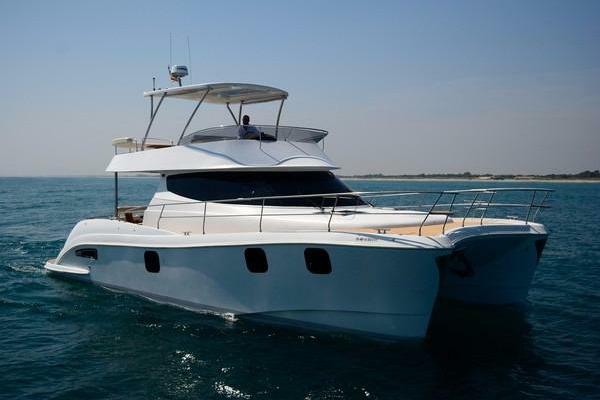 The owner’s cabin is to starboard aft and has a queen-sized bed, comfortable settee and plenty of storage. The companionway moving forward offers a full-size refrigerator-freezer and laundry facilities. Continuing forward is the master head followed by another separate vanity and a full-size shower. The feeling of bright, open spaciousness is conveyed immediately upon entering the main salon/cabin. This area is tastefully appointed, and traditional cherry wooden interior is found throughout. A large dining table is to port and a comfortable settee is to starboard. The large open galley is forward to starboard and navigation station is forward to port. On the starboard, forward in the salon is the fully equipped galley with its bar counter and two bar swivel chairs. This galley up allows the cooks to be included in the entertainment, and access to the dining table and salon seating is easy. The owner’s cabin is to starboard aft and has a queen-sized bed, comfortable settee and plenty of storage. The 2 guest cabins are to port and pleasingly spacious. Both Cabins have ample head room, queened sized beds, individually controlled air-conditioning, en suite bathroom facilities with an independent shower. Ready for a true adventure “Jon Boat” on deck systems have been fully upgraded in 2018. Engine Hatch expanded for easier access. The Helm is located to starboard in the aft cockpit. Her current owner has done a complete refit that boasts state of the art navigation, communication and safety systems which will enable her to circumnavigate the world again with her new owner. All the mechanical systems aboard are recently updated and in excellent condition. She is repowered with twin economical and dependable Yanmar 80 HP engines with 5 year warranties that will give many hours of trouble free cruising for the new owners. This Marquises 56 was purchased by a very knowledgeable Veteran who refitted her and was planning on world wide cruising. Due to a change in his plans this wonderful vessel is now available. With little left to do aboard besides giving her your signature she is ready to sail away. New to the market place and a must to see if you are pursuing your dream of worldwide cruising or looking to start your own charter business.